Jesus is God. When Jesus calls Himself the “Son of God” He is telling us He is the exact representation of God. Jesus left His heavenly home, took on humanity, to walk among us and lead us to Him and to our rightful home with Him. From the very beginning God’s plan included walking among His people. Jesus was there in the beginning, and He will be there at the end when He rides in on a white horse with “King of kings” and “Lord of lords” (two of the names of God used in the Old Testament) written on His thigh. Jesus is the fulfillment of all the names of God. Jesus is the fulfillment of all the laws of God. Jesus is the fulfillment of all the attributes of God. The plan since before the formation of the earth was always Jesus. Through Jesus every promise God has ever made comes to pass. Through Jesus everything we were created to become flourishes. You cannot have God without Jesus because He is God and eventually everyone will know it. Because of Jesus, we are not left to wonder what God is like. Jesus is the exact imprint of God’s nature. Repent of neglecting the teachings of Jesus. Pray and ask Jesus to reveal to you where He is able and willing to do more for you than you have the faith to ask for. Listen and think about Jesus and all that He has done for you. Meditate and imagine standing in front of Jesus. Ask Him what He would like you to give to Him. Imagine yourself giving it to Him. Then ask Jesus what He would like to give back to you. Imagine yourself receiving it from Him. M’kaddesh translated in English conveys being set apart and consecrated, to be prepared and made holy. It also implies a process of being more and more known and understood. God is holy and it is not enough for Him to be holy and separated from us. He does what we cannot do on our own. He makes us holy too so that we can be with Him. It is not just a position or a relationship to holiness that M’kaddesh speaks to, but instead a participation in His divine nature through His works. We don’t deserve to be holy, but through Christ’s atonement we are prepared, set apart and consecrated to participate in the holiness of Christ. ! Where are you not allowing God, revealed to us as Yahweh M’Kaddesh, to sanctify you and make you holy? Repent of choosing sin over Yahweh M’Kaddesh’s will to sanctify you and make you holy. Pray and surrender the places you are struggling with sin to Yahweh M’Kaddesh and ask Him to sanctify you in these areas. Listen and allow the Holy Spirit to show you places you don’t even know are there that need the sanctifying work of Yahweh M’Kaddesh. Meditate and imagine Yahweh M’Kaddesh showing you how things could be if you would allow Him to work inside you to sanctify places in your heart or your life. 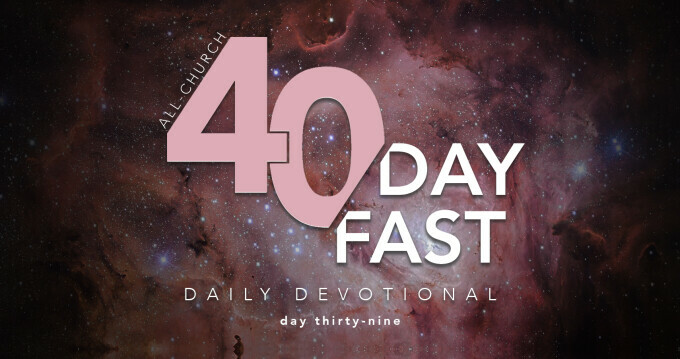 This devotional was developed as part of the All-Church 40-Day Fast. Names are important. Names are more than just labels that separate us from other people. They tell others something about us. Every time our name is mentioned it brings to mind a picture and a set of characteristics that define our identity. When people who know us hear our name they immediately recall our character and our face. There are over 900 names of God mentioned in the Bible. Many of these names either display an aspect of His character or were inspired by a specific incident of God intervening in the world. If we aspire to understand who God is we must pay close attention to how He has revealed Himself. We need to listen to what role He wants to play in our lives. We must acknowledge what He can do. We must align our thoughts with what He does in and around us. Understanding His names helps us with all of this. There are many ways you can use this devotional. You may find that you interact with the devotional in the same way each day, or you may find that you focus on a different aspect of it each day. There is no “better” way. What we have done is given you the name of God and defined it for you. We have picked one verse as our key verse for each name. Sometimes it is the verse where God first revealed His name, and sometimes it just embodies the meaning in the most succinct way. We have also given you a series of prayer starters. You may want to pray through all the questions, or one may jump out at you. A list of scriptures is also provided from the Old and New Testaments where the attribute aligns with the particular name, even if it does not use it. You may just want to look some or all of those scriptures up and interact with them or use them to pursue deeper understanding. Our goal is just that as we put away self and focus on God for 40 days we might use the time to delve deeper into His identity. We pray that during these 40 days we will grow in our knowledge of God, and that the study of His names will equip us to know Him intimately and accurately.